When the RockHounds host the 2018 Texas League All-Star game, the stars on the diamond will have a very impressive "supporting cast." Oakland Athletics all-time greats Jose Canseco and Rollie Fingers will be special guests at the event, scheduled for Tuesday, June 26, at Security Bank Ballpark. A tremendous evening at "Rocky Town" will include an autograph session (4:30-6:00 p.m.) and Home Run Derby (5:55 p.m.) before the game, followed by a spectacular fireworks show to bring down the all-star "curtain." Gates will open at 4:15, with the first five hundred (500) fans receiving a free All-Star T-Shirt. A Happy Hour (5:00-7:00 p.m.) will accompany the autograph session and Home Run Derby, all leading up to the first pitch. The game, matching stars from the Texas League's North and South Divisions, will be preceded by a Commemorative Air Force (CAF) flyover along with an appearance by Team Fastrax (Professional Skydiving). Rocky RockHound will "host," of course, and he'll have plenty of friends to help entertain. 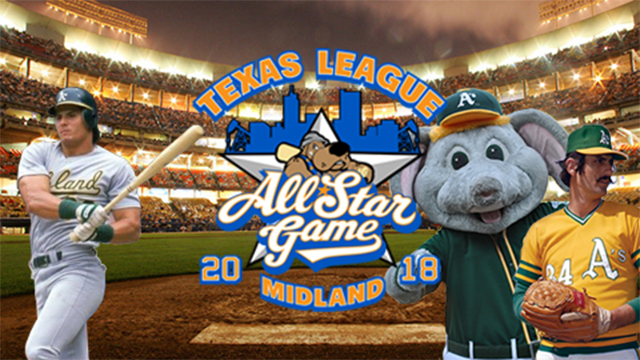 Mascots from all eight Texas League teams will be on hand along with a very special guest - - "Stomper" (the elephant), mascot of the Oakland A's. Jose Canseco and Hall of Famer Rollie Fingers are two of the greatest players in Oakland Athletics history (the A's have been the RockHounds' Major League affiliate. Both take part in the pregame autograph session. - A six-time All-Star, Jose Canseco played in three World Series' with Oakland, winning the Fall Classic with the A's in 1989 (he also won a World Series ring with Tampa Bay in 2000). The American League MVP in 1988, Jose hit 462 home runs in a 17-year big league career that included two stints with Oakland and three seasons (1992-94) with the Texas Rangers. As half of the famed "Bash Brothers" (with Mark McGwire), Jose twice led the American League in home runs (42 in 1988 and 44 in 1991) and hit career-high 46 homers with Toronto in 1998. - Regarded as the "pioneer" of modern relief pitching, Rollie Fingers was inducted into the Baseball Hall of Fame in 1992. The seven-time All-Star was a member of Oakland's remarkable run of three consecutive World Series championships between 1972 and 1974 (one of only two three-peats in the last half-century) and was named MVP of the Fall Classic in the last of those championships. After nine seasons with the A's (1968-76) and four with the San Diego Padres (1977-80), he won both the American League Most Valuable Player and Cy Young Awards as a member of the Milwaukee Brewers in 1981. The man with the trademark handlebar moustache recorded 341 saves in his 17-year Major League career. Rollie's career earned run average was an outstanding 2.90, but he was even better in postseason play. In 30 playoff appearances, he posted a 2.35 ERA, including a remarkable 1.35 in 16 World Series games. The 2018 Texas League All-Star Game will mark the fifth time the league's midseason showcase has come to West Texas. The Angels hosted the event twice at Angels/Christensen Stadium and the RockHounds are hosting for the third, each at the Scharbauer Sports Complex. For most of the Cubs era (1972-84) the All-Star Game host city was not based on a "rotating schedule," so the Cubs never played host to the game. For all intents and purposes, the league's eight cities have (with only a few exceptions) rotated as the game's host since 1983.